The Ashley Furniture Juararo Two Drawer Night Stand is replicated rough-sawn oak of the Juararo nightstand which has a vintage finish that is reminiscent of a timeworn family heirloom. The Juararo nightstand is made of sleek hardware with snappy finishing touch. Dimensions: 24.25" x 16" x 29.5"
The Juararo Two Drawer Night Stand Dark Brown has many exciting features for users of all types. You can extend the lifetime of your Juararo Two Drawer Night Stand Dark Brown with the purchase of a FactoryOutletStore Factory Protection Plan. 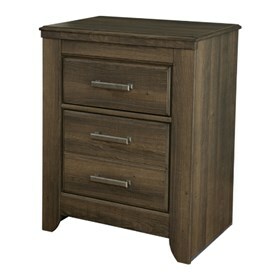 See the Juararo Two Drawer Night Stand Dark Brown gallery images above for more product views. The Juararo Two Drawer Night Stand Dark Brown is sold as a Brand New Unopened Item.